TheSpirit Mars rover is within striking range of attaining a onceout-of-the-question mission milestone: Reaching the summit of Husband Hill atits Gusev crater exploration site, high in the Columbia Hills, named after theastronauts lost in the tragic shuttle reentry accident of 2003. "I'mgoing to go out on a limb and say that I think our chances of making it to thesummit look pretty good now," said Steve Squyres, lead scientist at CornellUniversity for the Mars Exploration Rover effort. "We'reabout to start naming rocks up [t]here after famous mountaineers," Squyres toldSPACE.com, "so that gives you alittle insight into our mind-set!" Squyres,as well as Chris Leger, one of Spirit's main drivers, are both climbers. "Soon a gut level we'd really like to get to the summit," Squyres said. "And thescientific case for going to the summit is very solid. But we're doingmountaineering for which there is no precedent. So I've been trying not to getmy hopes up." Squyres said the terrain facing Spirit has been very solid of late, and thedriving has gone well. Onthe other hand, scaling Husband Hill has been slow going, primarily due to therich bounty of observations on the way. "We'dgo a lot faster if the science weren't so good! The upper reaches of HusbandHill are turning out to be a remarkably target-rich environment," Squyresadded. As example, a "fabulous new outcrop" dubbed "Voltaire", he said,"doesn't look like anything we've ever seen before." Voltairehas received close inspection by the rover's science instruments, Squyres said,prior to resuming the summit assault. "It's just too interesting to pass up." FromSpirit's vantage point at the summit, what kind of outlook can be expected? "Weshould get a good view to the horizon in all directions, which should be prettyspectacular. I think, however, that it might be hard to get a really good lookin all directions at the lower flanks of Husband Hill itself," Squyres said. Notonly is the summit pretty rounded, Spirit itself isn't very tall. "Sowe may have to proceed down the south side of the hill a little way beforewe'll be able to say much about what's on the other side," Squyres said. Spiritis making "discovery after discovery" on Husband Hill, Squyres said in a recentupdate on the Cornell-based Mars rover website. Theclose-at-hand reaching of the summit - after lengthy bouts of the robotslipping, sliding, and clawing its way up the slope -- has sparked discussionwithin Spirit's science team, Squyres remarked. "Thestrong feeling on the team is that we should try to go for what we've beencalling 'Summit 2'...which is both closer to usand a little bit higher than Summit1," Squyres reported. WithSpirit's imminent arrival at the select pinnacle, rover scientistswill probably want to take a fairly substantial panorama there, then wheel downonto the lower flanks of Husband Hill, Squyres said. Ithas been an interesting time working on Spirit these days, Squyres added, "aswe try to find the right balance between our eagerness to get moving up thehill and our excitement over all the new stuff we're finding at Voltaire." All looks good for reaching the summit in short order, saidLarry Crumpler, a Mars rover science team member and a research curator involcanology and space sciences at the New Mexico Museum of Natural History andScience in Albuquerque. "The plan is to start driving in a southeasterly directiontoward one of the summits, the exact one being determined after we get a lookat the terrain ahead," Crumpler told SPACE.com. In terms of the significant events or "arrivals" duringSpirit's mission, wheeling up to the summit "probably ranks as one of thegreatest," Crumpler explained. "This will be one of the biggest events in themission." Crumpler said that arrival at the summit within the ColumbiaHills marks the end of Spirit's long climb that has been underway since sol330, or about 230 sols ago - with many stops along the way. A "sol" (Latin for"sun") is the Martian equivalent of a day in reference to the planet'speriod of rotation. 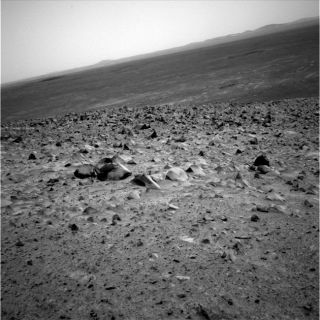 Spirit landed onMars at Gusev crater in early January 2004. Its sistercraft-- the Opportunity rover - touched down a fewweeks after Spirit and is busy trekking about Meridiani Planum on the otherside of the planet. Claiming victory in getting to the summit will depend onwhether some "utterly compelling target" shows up en route, Crumpler advised. "The desire is to get to the summit, do what needs to be done there, and startheading down as soon as possible." "At the summit we will probably spend some time doing a largepanorama," Crumpler said. "One of the goals there will be to take a hard lookat the basin to the south where one of the long-term targets of interest --'Home Plate' -- is located. Specifically we will want to see what the bestroute might be." Crumpler advised that there is some fairly steep terrain onthe other side of the hill that Spirit will have to descend, so finding thebest path is a top agenda item. "One of the considerations is that many of us would like toget a look at the possibly layered terrain on the east side of the basin on ourway to Home Plate," Crumpler said. Yet another factor is the distance. HomePlate is roughly a mile away from Spirit's current location, which may take afew months of driving. "In a couple of hundred sols we will need to startconsidering the decreasing elevation of the Sun again," Crumpler said, "so itwould be nice to have north-facing slopes available either before or afterreaching Home Plate." Crumpler recalled that, shortly after Spirit touched down,there were longing looks at the Columbia Hills in the distance. At that time,talk of possibly wheeling the robot to that faraway geological feature wastypically met by laughter, he said. "None of us thought we would ever be in the hills, let alonebe on the summit," Crumpler concluded. TheMars Exploration Rover work is yielding a wellspring of science data, Squyressaid, stressing that point in his justreleased book: Roving Mars - Spirit, Opportunity, and the Exploration of the Red Planet(Hyperion Books, August 2005). In the book, Squyres writes about themelding of humans and far-flung machines to study Mars...of sending roboticsurrogates for human explorers into an unknown environment on a voyage ofscientific discovery. "The key is not just to follow the robots, but to followthe intense and passionate people who conceived and built them."